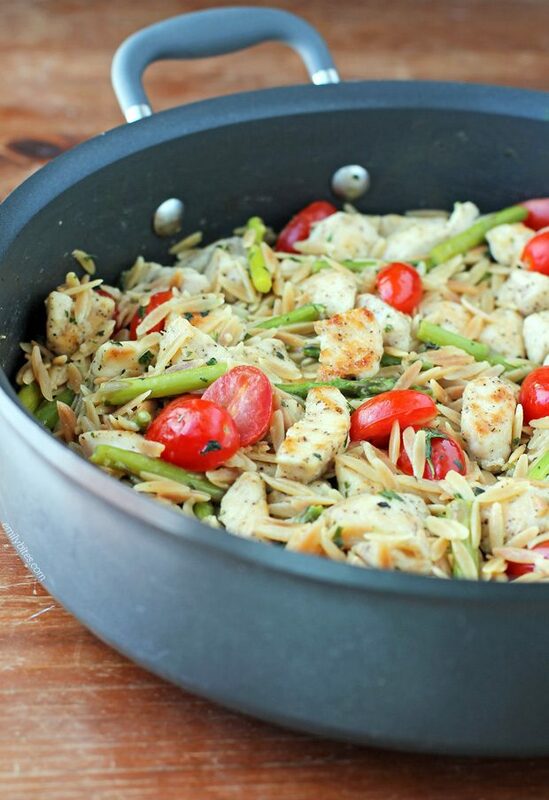 I am so excited about this Lemon Chicken Orzo with Tomatoes and Asparagus. I know I’m always excited about food, but I seriously want to start making this weekly. This pasta dish is an easy, one-pot recipe that tastes bright, fresh and perfect for Spring or Summer (or those of us looking out at the snow and wishing it was). With pasta, chicken and vegetables I found this dish very filling and the lemon and garlic flavors had me swooning. You can also bulk it up further by adding extra veggies (e.g. stirring in a couple handfuls of fresh spinach at the end) if you have some on hand. 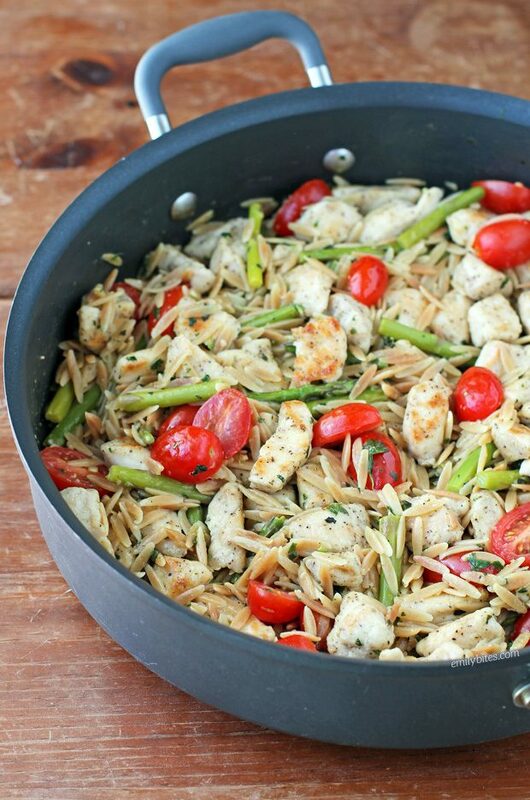 A satisfying serving of this Lemon Chicken Orzo with Tomatoes and Asparagus is just 368 calories or 6 Weight Watchers SmartPoints. It’s perfect for a weeknight meal or to make ahead and eat for lunches throughout the week. Even better still, you can warm up your leftovers or eat them cold like a pasta salad – it’s delicious both ways! Looking for more tasty, lightened up one-pot meals? Check out my recipes for Beefy American Goulash, Rustic Sausage and Potato Skillet, One-Pot Cincinnati Chili Bake, Sausage and Tortellini Tomato Soup, Chicken Pesto Parmesan Pasta Skillet, Beef Stroganoff, Pumpkin Alfredo Tortellini Skillet, Beef Taco Soup, Cheesy Chicken Veggie Pasta Skillet, Spicy Taco Gnocchi Skillet, Chicken and Chorizo Salsa Skillet, Best Turkey Chili, Sausage Tortellini Skillet, Spaghetti and Meatball Soup, Spicy Sausage Pasta, Broccoli Cheddar Soup, Bacon, Cheddar and Beer Risotto, Barley Beef Skillet and more in the One-Pot category of my recipe index. Combine the flour, garlic powder, pepper and salt in a small dish and stir to combine. Place the chicken pieces in a gallon zip-top bag and add the flour mixture. Seal the bag and shake/massage it around until the chicken pieces are coated. In a large saute pan, bring the oil over medium heat and then add the chicken. Stir to coat with the oil and then cook, stirring occasionally, until the chicken pieces are cooked through and begin to brown. Transfer the cooked chicken to a side plate and cover with aluminum foil to keep warm. Wipe out the inside of the skillet. Place the skillet back over medium heat and add the butter. When the butter is melted, add the orzo to the pan and stir to coat. Spread the orzo across the surface of the pan and allow it to cook for 2 minutes until a few of the orzo pieces begin to brown. Add the garlic to the pan and stir. Allow to cook for another minute. Add the chicken broth to the pan and bring it to a boil. Reduce the heat to low to simmer and cover the pan. Simmer covered for 4-5 minutes and then add the asparagus. Stir and re-cover. Simmer for an additional 10 minutes. Remove from heat and stir. Add the lemon juice, tomatoes and basil along with salt to taste. Stir together and then add the reserved chicken to the pan. Stir to combine and serve. This looks so good, and I think it could be made with shrimp instead of chicken, as well. Another hubby-approved meal! He had seconds…and then thirds! We both really enjoyed it. Will definitely make this again. This was so delicious! Tastes like spring or summer. I threw the whole pound of asparagus in and I think next time will add a bunch of zucchini or squash too. The more veggies the better, right? Great dish to kick off spring. I made this last night, it was the perfect meal for the first day of spring!! Hubby and toddler approved, and I love that it’s all made in one pan. I will definitely be making this dish again! I made this last night for dinner and just couldn’t get enough of it! Perfect spring-time meal. Absolutely delicious! This was delicious and very easy. Made enough for me to share with a neighbor who is also doing WW! Still have 3 more meals even after sharing. Thanks so much for a great recipe. I will be making this again! I modified this a little to make it Weight Watchers Simply Filling (omitted the flour and light butter, and just used olive oil from my Misto) but I could not find wheat orzo anywhere! Ended up substituting Farro instead. Came out great! Thanks! I made this for dinner yesterday and followed the recipe exactly. My husband & I loved it. It was wonderful as written, but the next time I make it I think I’ll increase the amount of vegetables. Thank you! Oh my gosh, this was SO delicious! So many wonderful flavors that work so well together. Will be making this again soon! I used green beans because I don’t like asparagus, 🙂 and it was so good! My BF loved it, too! And such a generous portion for the WW SmartPoints! Thank you!! My husband and I both loved it, the first time and as leftovers! I may add more veggies the next time I make it, but there will be a next time! This dish is delicious! Very light and flavorful. Thank you Emily!!!! I was starting to get bored of my typical roasted asparagus, this seems like a much more interesting recipe. Delicious! My husband and I had it for dinner last night and are having it for lunch today. Love it! I can also picture adding some feta cheese to this, if you have the WW SP for it. Thank you! OMG! I am struggling to get started on WW and stick to it. Tracking is my nemesis. I made this the night before last and it was so dang delicious. I left out the asparagus and added a bit of avocado the second day I had it. It was so good!! I just made this dish and my hubs and I loved it! I added mushrooms. Thanks! I make this dish about once a week now. Good dish that uses fresh seasonal produce and pantry staples. Easy to throw together. Even my two year old eats it. We add a sprinkle of parmesan at the end. I have made his dish twice so far and we love it. It taste so fresh! Thank you for such a wonderful recipe. You directions are always spot on. My son-in-law went back for seconds, and told me it was “freakin’ good.” A major compliment. We made this without asparagus as my husband doesn’t like it (booooo!) and it was a hit! My mom keeps asking us to make this again. I think it’s safe to say this will be in regular rotation. Thank you Emily! THIS RECIPE WAS DELICIOUS! I took some of the leftovers for friends to try and am going to make another batch this week! I cook on the weekends. My bride of 25 years loved it! Thanks for sharing. Thank you for the recipe! Even my very picky husband loved it! This is a new staple at our house! This recipe was excellent! My boyfriend loved it and was so surprised when I told him it was a lightened up recipe. My only failure was in not having fresh basil on hand but dried basil worked, I just added it sooner. I bet it will taste even better with fresh basil! Definitely a new favorite. Was excellent as published. Next time I will try no meat, will add a bunch of spinach and note lemon juice. I really don’t like much meat. I made this for dinner tonight and loved it. One thing though is that when I put in the figures as listed it comes out to 9 Freestyle SP, not 6. Other than that I followed your recipe as written and it came our great. Will most certainly make it again and again. Hi Karen, I think this answer from my FAQs will help you! I’m back again! I made this last night after a long break from cooking, and it reminded me how much I like cooking no asparagus again, since husband still isn’t a fan, so we just cooked the orzo for 15 minutes. Didn’t have fresh basil so we added a tablespoon of dried basil, and an extra tablespoon of lemon juice because I wanted it lemony! Turned out AMAZING. Thank you again Emily for sharing this and all of your recipes! They’ve really helped in my weight loss, and I’m down 60 pounds! Emily your website is inspiring me every week to continue this journey. Thank you! It is so SO rare to find a dish that is just as delicious hot as it is cold, but this one hits the nail right on the head. Love the versatility of it! I doubled the salt and added the zest of the lemon I juiced, as well. Yummmm!